Cheap Healthy Meal Plan – gluten free and Trim Healthy Mama! I was challenged to expand my cheap healthy meal plan for Trim Healthy Mama (check out $7 dinners HERE and HERE) to include breakfasts and lunches, and I wanted to share the results with you! 21 meals (plus snacks) that fed my family of six for a week, and I spent under $100 at Kroger! I needed cheap dinners for 6, and I was able to do it! It comes close to $4.75 per meal, less if you count the snacks. These are some of my family's favorites, and many of these are incredibly simple, throw-together meals. Best of all, these are gluten-free, sugar-free, and THM-compliant. Plus, I didn't use any coupons or shop for deals. The only money-saving tip I used was to buy store brands whenever possible. But I wanted to see if I could get under $100 without spending time couponing, and without even using a Kroger card, and it was definitely possible. That means that many of you coupon experts could buy this same menu far cheaper than I did. I know that lots of these items would be cheaper in bulk, so you may save some money there, too. If you're not familiar with Trim Healthy Mama (THM), it's an amazing lifestyle change that helped me to lose over thirty pounds of stubborn baby weight in four months, and keep it off easily. If you don't have the book, I highly recommend it! (Plus, I included a lot of THM recipes in this menu plan, so you'll need it!) Please make sure you read the notes at the bottom of this post before you go to the store. You should have enough for at least two (if not more) of each breakfast and snack, but each recipe is only listed once on the printables, to show you what your options are. These recipes are from the original THM book, but you can find similar or copycat recipes on Pinterest if you only have the new books. I included my prices so you can see what I spent, but of course costs vary by location, so wherever you are in the US will determine if you get similar pricing or not. With the $7 menu, I had many people let me know that they shopped even cheaper than I did, so hopefully that will be the case for you, too! This menu fed my family of two adults and four kids. If you have four teenage boys, or huge eaters, you will probably want to add more protein (eggs, chicken, beans, etc) and throw it in with each meal. I also found that the 2 pounds of rice lasted longer than the week, so my kids got a serving of rice when I was having S meals, making it into a crossover for them. The only recipe that calls for heavy cream is the frittata (with my substitution to keep it low carb), so I used the rest of the container in my coffee during the week. Stir-Fry – use leftovers from the pulled chicken, and you can use whatever veggies you have on hand, but I put zucchini and cabbage on the shopping list for vegetables. Feel free to use your favorite stir-fry recipe (or one from the book) just make sure you add your different ingredients to the shopping list (and know that it will likely add up to more than $100). This price does include butter but does NOT include other staples, so if you have bare cupboards and no spices you might need to spend a little more. But I did include the staples on the shopping list, so cross those off if you already have them. If you don’t, just be aware that anything under the “Staples” heading on the shopping list will add to your cost. I did NOT included glucomannan (which you can buy online from Trim Healthy Mama) on the shopping list, because it's hard to find in stores, so I skip it in my Fat Stripping Frappas if I've run out. That's it! I hope this helps someone out! If you are able to coupon and save money on this list, I'd love to hear how you did it! Please comment with any tips you might have to make this even cheaper! Hi! I'm so glad you're here! I'm a working-at-home homeschooling mom of 5. I write about my experiences homeschooling and share lots of tips about organization and the Trim Healthy Mama way of eating. I personally answer every comment and email, so please feel free to contact me. I'd love to hear from you! Thanks Dawn! I like cauli rice but I haven’t been able to find a good price on cauliflower in my area. Sounds like a great substitution! Sometimes I find it very cheap at Aldi or in the marked down produce area in other stores. Many times I just buy frozen, I think a package runs around $1.79 or something like that around here. But there are some weeks even that is too much! I can’t believe how much food costs any more. I used to feed 6 of us on $60 a week…although that did mean more processed foods but even now I doubt you could do that unless you’re a super couponer. I’ll have to check it out, thanks! Thank you for making your information printable. This is amazing!! I was literally going to give up on THM today because it’s just too overwhelming to manage while pregnant and penny pinching. 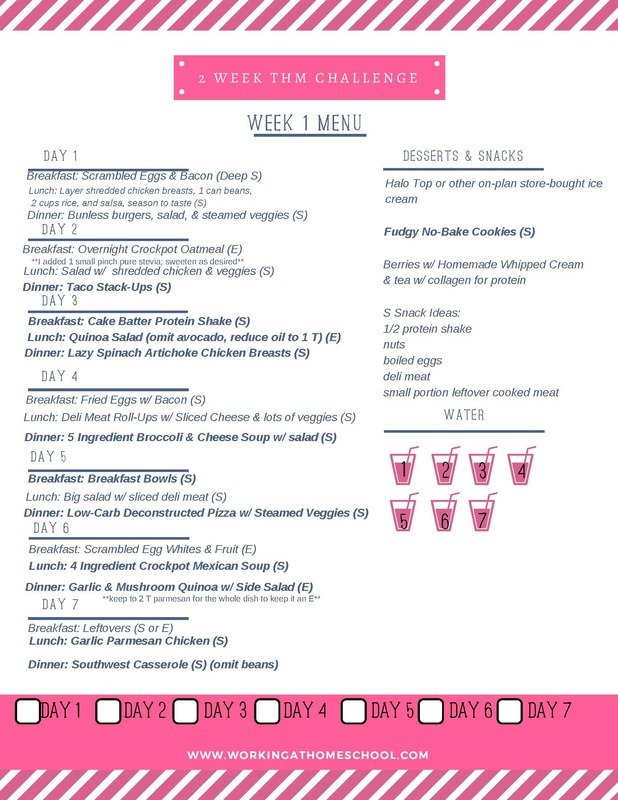 And this is the first meal plan I’ve seen that actually fits my family without weird dinners. Thank you so much!! Please consider doing more of these!!! This sounds amazing. I’ve been putting off starting because we have a super low budget. This looks doable. You have listed protein powder as a staple. This is an expensive item. If you are using multiple servings a week, that cost adds up quick. I feel like it should be considered in the overall menu cost. Which brand do you buy? How frequently do you go through it? I’m sorry, i don’t mean to be critical. I appreciate what you are doing here. Your menu is great! I’m just trying to keep costs down, but protein powder is hard for me because of the price. I tend to make the FSF with 1/2 serving to spread it out, but then I’m only getting half the protein! Hmm… Suggestions? Protein powder is for the Fat Stripping Frappa, so you could either skip it or substitute low-fat cottage cheese (about 1/2 cup) to add protein. It does change the flavor a bit, but it definitely doesn’t taste cottage-cheesey. I get my protein powder from the bulk bin at Winco, it’s very reasonable and you can buy just what you need for the week instead of a large quantity. Great tip, thanks Hayley! I don’t have a Winco in my area. Or an Aldi – I feel like I’m in a cheap grocery wasteland here in Colorado! If you don’t have protein powder, you could try cottage cheese. It adds protein without adding a cheesy taste. If you look at DashingDish.com, their shakes are low-glycemic, work for THM, and taste delicious, but use cottage cheese in addition to the protein powder. I’ve skipped the powder, and it’s still enough protein to qualify as a good THM shake. Some of them have instant pudding listed as an ingredient, but I always skip the pudding and it still tastes great. I always eat the same as the rest of the family, I just serve brown rice or potatoes for the kids in addition to S meals, and extra fats for them when I eat E meals. I’m not sure what’s available where you live, though! I know you have different challenges, but I think there’s a THM Facebook group for people out of the US. They would probably have some great ideas for you! This is just what I needed!!! I am trying to get back in a THM groove. It is always helpful to have some menu ideas. i was wondering as well about the smoothies. I saw your responses about using cottage cheese rather than protein powder, and I appreciate that tip! But what about the almond milk? Don’t you use more than one container per week with that many smoothies? Can you be more specific on how you do frugal smoothies at your house? I am intrigued 🙂 Thanks! I go through one carton every week and a half or so. I’ve also tried to sub 1/4 cup of water for 1/4 cup of the almond milk and haven’t noticed any taste difference. Where is the recipe for the spicy chicken wings? That is awesome, such a great job of calculating and planning everything out! Amazing job 🙂 This is an inspiration to so many families around the globe for sure. In my opinion, great savings only happen with great goal planning! Thanks for this! So well planned out. I love lists and organization. Plus, I love to save and plan. So this is right up my alley. Thanks for sharing this post!!! Thank you for sharing this! I will be studying it as I am having a hard time feeding myself THM and the rest of the family our normal “healthy” foods with our small budget. It will be harder for me as I have double the people and only $80 a week, but I should be able to glean some information to at least help myself stay on plan. This is great in theory, but you can’t eliminate the staples when figuring the cost. Most people don’t have the expensive protein powder on hand, or the other expensive (or potentially expensive) spices. It’s a good starting point, though. I think you easily could – especially the protein powder, because you could use cottage cheese in it’s place for a great substitute with little taste difference. This list does assume that someone is already using the THM program and already has some staples, though. Hi thanks for doing a simple menu plan it is just what I was looking for. I was wondering what you meant by “whole grains” in the staples section? I had a question, hopefully you still monitor this page, how old are your kids? And the younger ones, do they eat the protein shakes and frappas and that’s good for them? My kids are 4, 2, and almost 2. They can be a bit picky. Also, where do you get your protein from and what is the cost? Lastly you mention something about protein from cottage cheese? My 5 kids range in age from newborn – 11 years old. They LOVE it when I make frappas and shakes for them! When we’re tighter on money, I’ll put honey in theirs and make a separate one with stevia for me. Honey is fine for growing kids, but I still try to limit it. I have no problem giving them stevia, but when it’s a cost issue they’re fine with honey instead! I buy protein powder from Trim Healthy Mama directly, because there’s no junk or fillers in it and it’s one of the cheaper options I’ve found. Yes, cottage cheese is a great alternative to protein powder. I often make a shake with almond milk, stevia and protein powder for myself (although I’ll omit the protein powder and add cottage cheese if I’ve run out), and make a shake with frozen berries, raw cow’s milk, honey, and cottage cheese for the kids. They love it! Hello, thank you for this great list helping us get back into healthy cooking! We live in northern alberta and even at walmart I found most items to be more expensive than on your list so I went over 100$ but it is still much better than 250$ a week!! Hi Linda, thanks for reading and commenting! I’m glad you found the list useful – I was concerned about the costs in other countries. Here in the U.S. I’ve gotten a lot of feedback about the cost varying state by state. In some it’s much cheaper, and in others it’s much more expensive. I’m glad you found a way to make it work! I’m just starting my THM adventure, so I downloaded your menu as a starting point. I’m a little confused on a few points, and I’m hoping you don’t mind clearing them up for me. Regarding the frozen mixed veggies; you have them listed in two meals, but don’t say in what proportion. Should I make 1/2 bag for each meal? The same thing goes with the greek yogurt and boiled eggs for snacks, you don’t list any proportion. Or is this information I should be gleaning from the THM books? Also, are the breakfast, lunches and snacks for one person, or family sized? I homeschool so I have someone eating with me at every meal. You got it – 1/2 a a bag for each meal, unless your family needs more. There aren’t really any proportions for the snacks, because with THM you eat until you’re satisfied. I usually eat 1 or 2 boiled eggs, and 1/2 cup Greek yogurt at a time, but it could be different for you. I fed my family of six with this menu, so everything was family sized. But, for example, 1 can of garbanzo beans might not be enough for another family of six. So it would be good to look over the snacks and decide if that’s enough for your family, and if it’s not, just add another can of beans, or more eggs. Rice and beans are great fillers to round out meals and stretch them for everyone. My kids aren’t losing weight with me, so I give them extra rice and beans at meals if they are still hungry, I just avoid them in S meals. I hope that makes sense, please let me know if I didn’t explain something well enough! This is great! Thank you so much for taking the time to do this. God bless!! Yes, it’s explained under “Menu Instructions.” You can put in whatever you want, but to follow THM and to go with this menu, I put seasoned black beans, brown rice, salsa, and Greek yogurt in a bowl. It’s really simple and delicious! Looks like a great meal plan! However, I’m confused about the THM page numbers? They don’t correlate with my THM cookbook, and I can’t find the Mexican Cottage Cheese Salad at all in the index. Are you using a different book? These are from the original THM Book. 🙂 A lot of the recipes here are available online or on Pinterest. I love this meal plan. Went out shopping and got everything. I have both THM books the plan and the cookbook but I can’t find some of the recipes you listed in the books. Was this a error or is there another book? Hoping you can help! Bridget, there is another book! It’s the original THM book, but you can find very similar recipes and copycats on Pinterest. I’m so sorry for the confusion; I hope that helps a little! Great post. I know it’s older but I am just seeing it for the first time today. So glad to see a low budget menu where every meal is not rice and beans. Thanks for checking it out! We eat plenty of rice and beans around here, so I wanted a change!